HOPE worldwide is an international non-profit, non-religious organization established in over 100 countries, reaching out to more than two million people annually. It has evolved from its humble beginnings with three local programs in 1991 to over 150 programs, implemented across the six continents with a focus on: Children, Education, Health, Senior Citizens, Employment and Volunteerism. 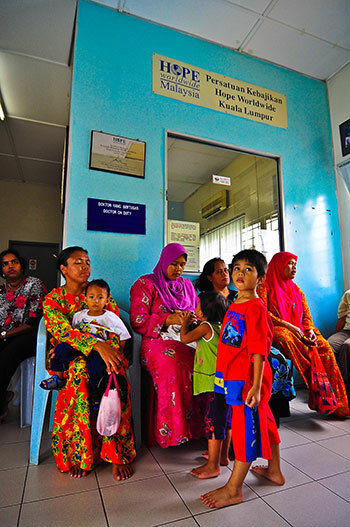 Since 1996, HOPE worldwide Malaysia is committed to bringing hope to the underprivileged and disadvantaged communities by offering them free healthcare, empowering them with new technology and creative skills, and building their confidence to face the world with pride in their existence and capabilities. With the support of a network of more than 300volunteers and various corporate organizations, we continue in our efforts towards changing lives for the better. Incorporated as Persatuan Kebajikan HOPE worldwide KL, we are legalized by the Registry of Societies and Inland Revenue with Tax Exemption Status – LHDN.01/35/42/179-6.5193. To bring hope and change the lives of the world’s most poor, sick and suffering. To change lives by harnessing the compassion and commitment of dedicated staff and volunteers for delivering sustainable, high impact, community-based services to the underprivileged & disadvantaged communities.